Click here to view premium recipes from the cookbook, Nature Has Flavor: Cooking Your Way to a Healthier Life. 1- Place a deep sauce pan over medium heat. 2- Add the olive oil and the onions and sauté until translucent. 3- Add the Arborio rice and stir well. Season with salt and pepper and mix well. 4- Add the white wine and cook over medium heat until reduced by ½. Start adding vegetable stock to the risotto, 2 cups at a time, making sure that 1) you stir the risotto continuously; and 2) all of the liquid has evaporated before adding more stock. 5- The amount of vegetable stock and time of cooking may change due to many variables, such as the kitchen temperature, humidity, type of pan used, and the strength of the stove. 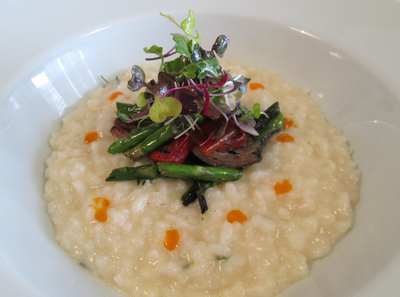 Please taste the risotto before making any decisions as to doneness. 6- Just before risotto has absorbed all of its liquid, add sunflower butter and apple sauce, and continue to stir. 7- When done, remove from the heat. Stir in the chopped chives just before serving with the roasted vegetables. 2- Place all the vegetables on a sheet pan, season with salt, pepper, NHF extra virgin olive oil and balsamic vinegar. 3- Roast the vegetable for 15 to 20 minutes, or until tender. 4- Serve the roasted vegetables atop the risotto.